We’re pleased to offer complete video of the OOSS Symposium 2016 @ AAO/AAOE Chicago, organized by chapters, for your viewing convenience. Join our Power Board experts — and some of the best minds in the industry — to explore the challenges and opportunities impacting the future of the ophthalmic ASC. Short on time? Check out our “Quick Look” trailer and the individual Chapter Previews. Jeffrey Whitman, MD, OOSS President and president & chief executive officer of Key-Whitman Eye Center of Dallas, Texas, introduces the five key initiatives of the OOSS Strategic Plan for 2020. With his signature style, OOSS Council Mike Romansky (6:25) delivers the latest news from Washington regarding office-based cataract surgery, HOPD and ASC rates, cost reporting, quality reporting, instrument sterilization, payment and regulatory reform and much, much more. 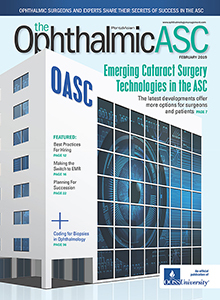 Bruce Maller, founder and president of BSM Consulting, explores the “fairly significant external factors impinging upon” the ophthalmic ASC, including growing demand for services, changes to Medicare/Medicaid and to the Affordable Care Act, and consolidation, particularly among payers. Steve Sheppard, managing principal of Management Consulting Group, thinks strategically about consolidation and positioning the ophthalmic ASC to thrive in a changing marketplace. With introduction by Jeffrey Whitman, MD. Moderated by Maria Scott, MD, OOSS vice president, AAO Councilor and owner and medical director of Chesapeake Eye Care and Laser Center in Annapolis, Maryland. Cathy McCabe, MD, OOSS board member and director of the Eye Associates Ambulatory Surgery Center/The Eye Associates of Bradenton, Florida, (1:15) discusses the importance of the right educational and professional development programs. John Grant, OOSS board member and associate director of AMSURG Corp. of Nashville, Tennessee, (5:46) outlines the three most important management systems for any ASC. Regina Boore, RN, OOSS Resource Partner and president of Professional Surgical Solutions, (7:25) talks about investing in technology and staff training to meet an ever-expanding regulatory burden and increased reporting requirements. Kevin Corcoran, OOSS Resource Partner and president of Corcoran Consulting Group, (13:56) offers solutions to the three key “problems” facing the ophthalmic ASC — more work, no help and no money. Moderated by Maria Scott, MD. The “future is already banging on your doors,” says Jerome “Jerry” Levy, MD, OOSS President Emeritus and president and chairman of the board of the Vision Center Network of America, LLC. (O:31) Levy advocates the Clinically Integrated Network as a model to prepare for a future in which payer consolidations put downward pressure on reimbursements. Richard Mackool, MD, chief medical officer of the Vision Center Network of America, (3:40) talks about positioning to seize opportunities and why “the big fish is worth more per pound than the small fish.” And Ellis “Mac” Knight, MD, senior vice president and chief medical officer of the Coker Group, (13:46) explores the ways a clinically integrated network can optimize quality while reducing costs. From legal compliance and anti-trust issues to governance, integrated information technology systems, and cost reductions, the discussion of the ASC-Centric Clinically Integrated Network continues with Jerome “Jerry” Levy, MD, Brian Wnorowsky, MD, and Glenn deBrueys, all of Vision Center Network of America. Wnorowksy, vice president of data management, talks electronic health records systems, and deBrueys, chief executive officer, explores optimizing quality while reducing costs. Session concludes with an audience Q&A. Chuck Marshall, head of Patient Engagement Strategy for Alcon US Surgical Marketing, introduces the company’s new patient information site, www.mycataracts.com. The “non-branded, product-agnostic” site is designed to educate and inform cataract patients as it takes them through the system. Introduction by Bradley Black, MD, OOSS Presidents Emeritus, medical director of Vision Surgical Center and founder of Dr. Black’s Eye Associates of Jeffersonville, Indiana.